Islander Private Charters specializies in Cod, Haddock, Cusk, Catfish and Pollack fishing charters. Massachusetts fishing charters, fishing from Rockport, charter fishing MA and Cape Ann. 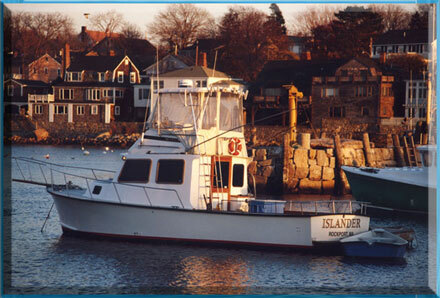 The Islander is a 34' diesel powered Sportfishing boat, with radar, gps, color fish finder, autopilot and vhf aboard. Islander is moored at T wharf, Rockport Harbor, Rockport, Massachusetts. Right next to the famous Motif #1.